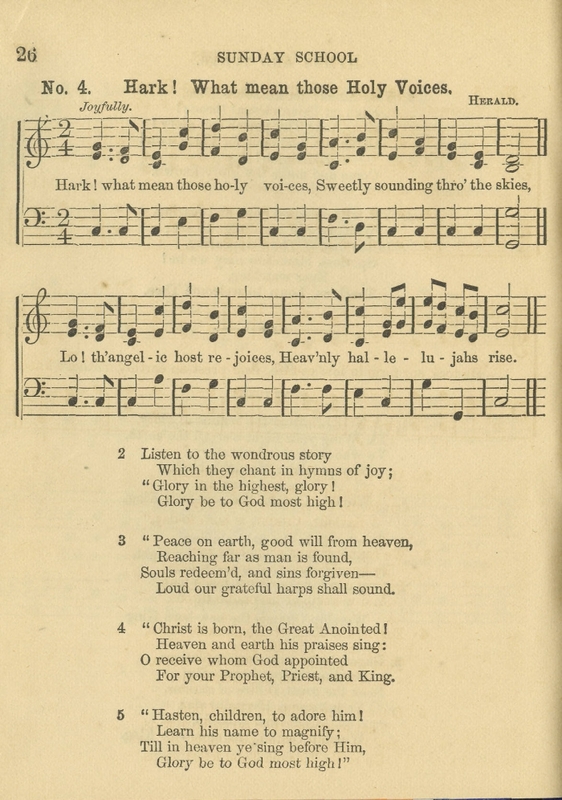 Alternate Titles: "The Wondrous Story," "The Song of the Angels in Bethlehem," and "The Golden Harp"
According to John Julian, these lyrics first appeared in Thomas Cotterill's Selection of Psalms and Hymns for Public and Private Use, 1819, No. 269. It does not occur in the 8th edition, 1829, or the 1836 Supplement. 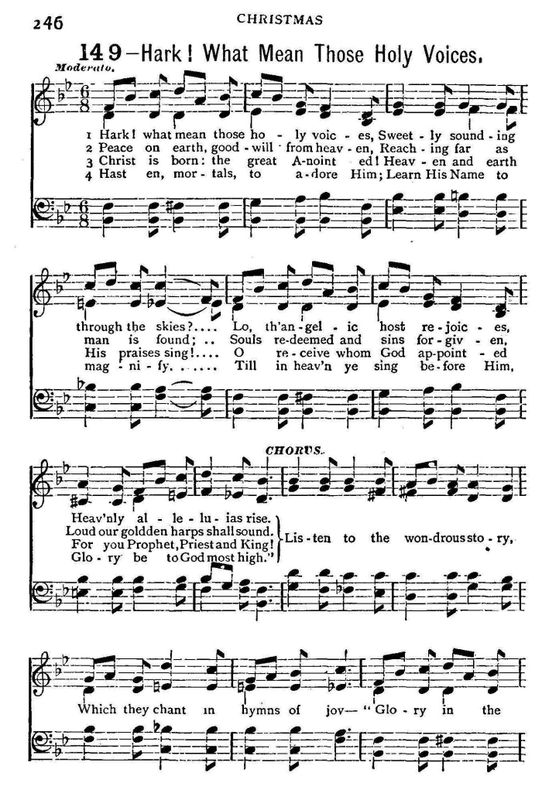 Source: James Montgomery, The Christian Psalmist. Third Edition. (Glasgow: William Collins, 1826), No 278, p. 244-245. Loud our golden3 harps shall sound. 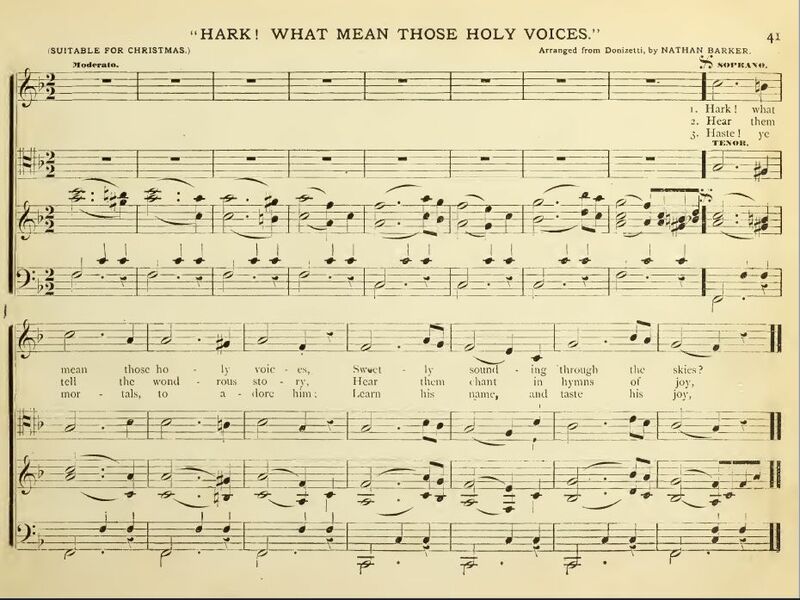 In this version, the first verse also acts as the chorus. 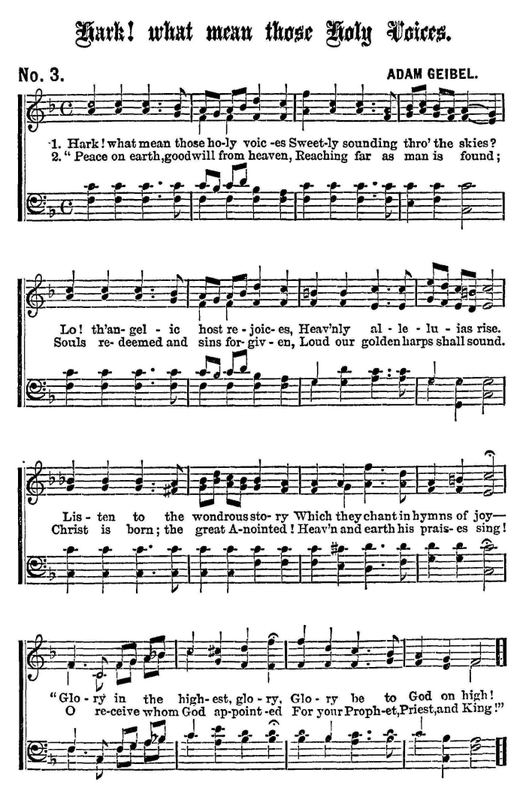 In this version, the second verse is used as the chorus to all other verses. Verse 6 is omitted. 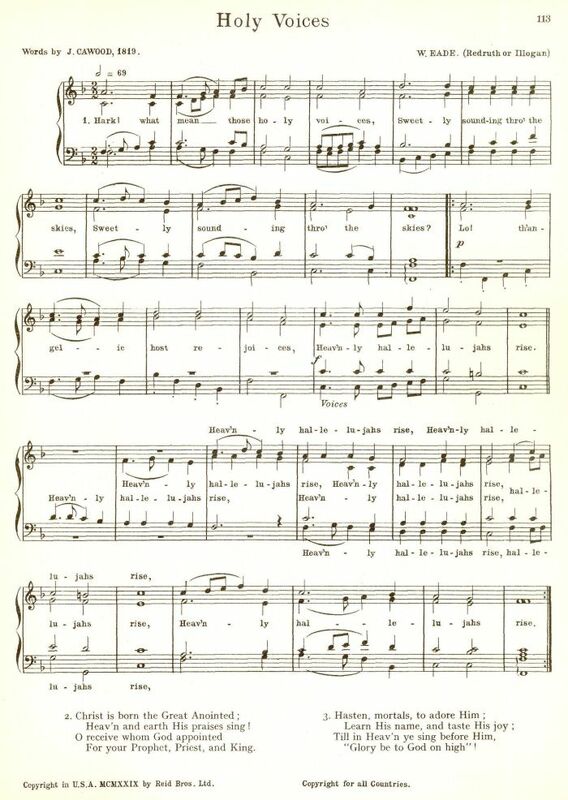 Sheet Music by W. Eade (Redruth or Illogan) from Ralph Dunstan, The Cornish Song Book (London: Reid Bros., Ltd., 1929), p. 113, under the title "Holy Voices." 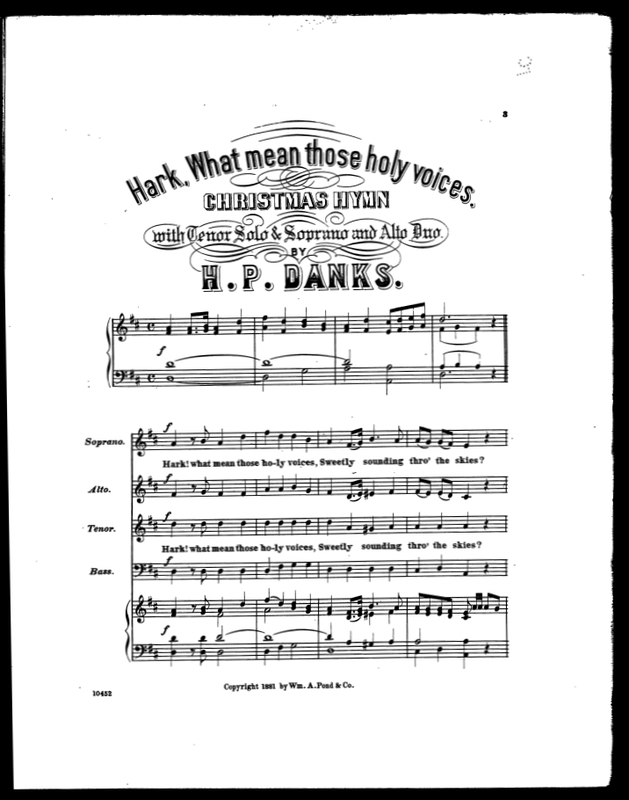 Sheet Music from John Clark Hollister, ed., The Sunday-School Service and Tune Book (New York: E. P. Dutton and Company, 1863, 1865), #5, p. 19. 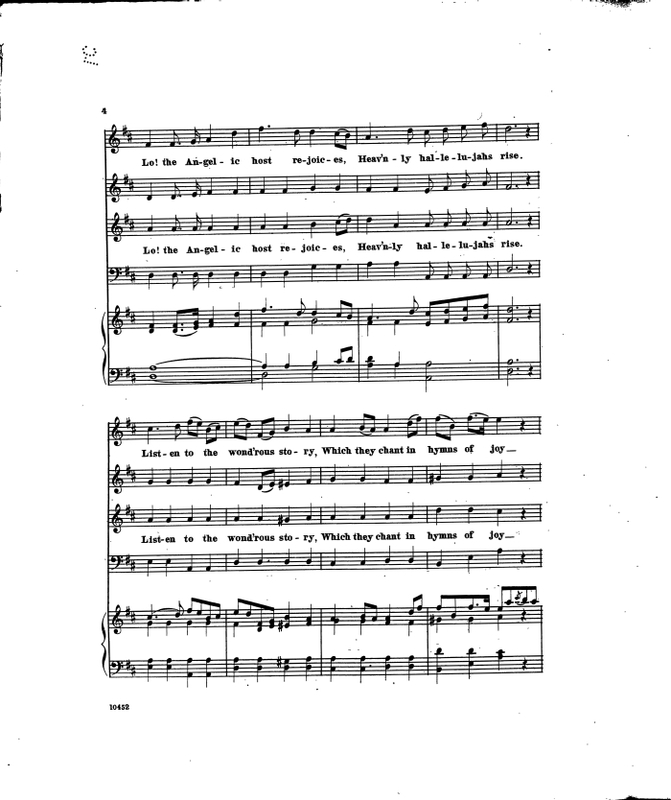 Sheet music "Herald" from A. 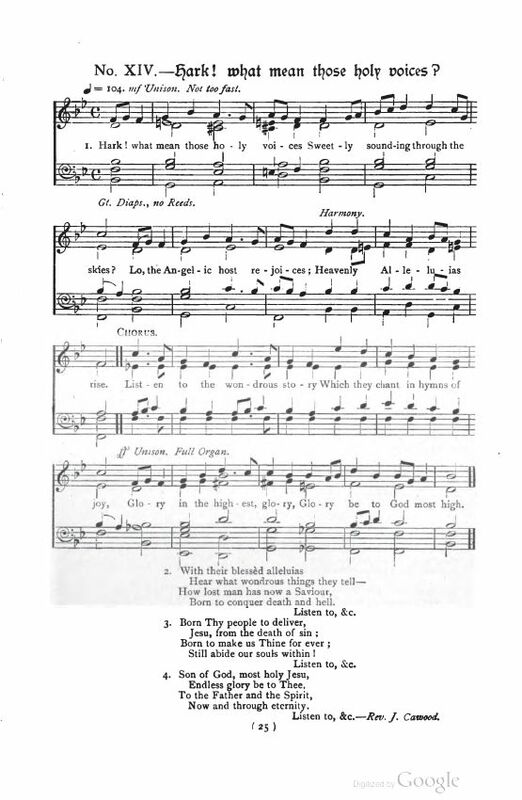 B. Goodrich, ed., A New Service And Tune Book For Sunday Schools (New York: Gen. Prot. Episc. S. S. Union and Church Book Society, 1863, New Edition, Enlarged, 1866), #4, p. 26. New York: Pond, Wm. A. & Co., 1881. Note from Pettman: No. 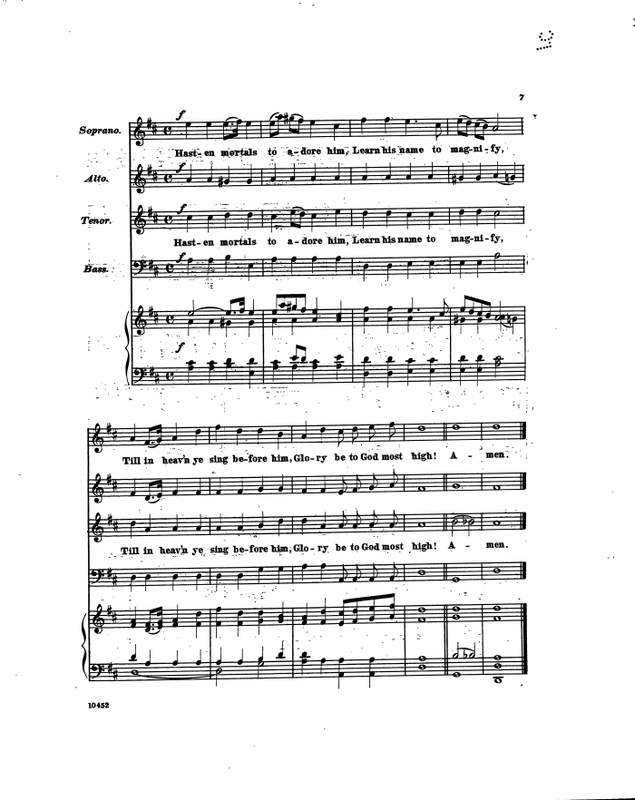 XIV.—May be sung as a recessional hymn, very solid, i.e. legato and full. The theoretical organist is requested kindly to fill up and expand the chords as much as possible. 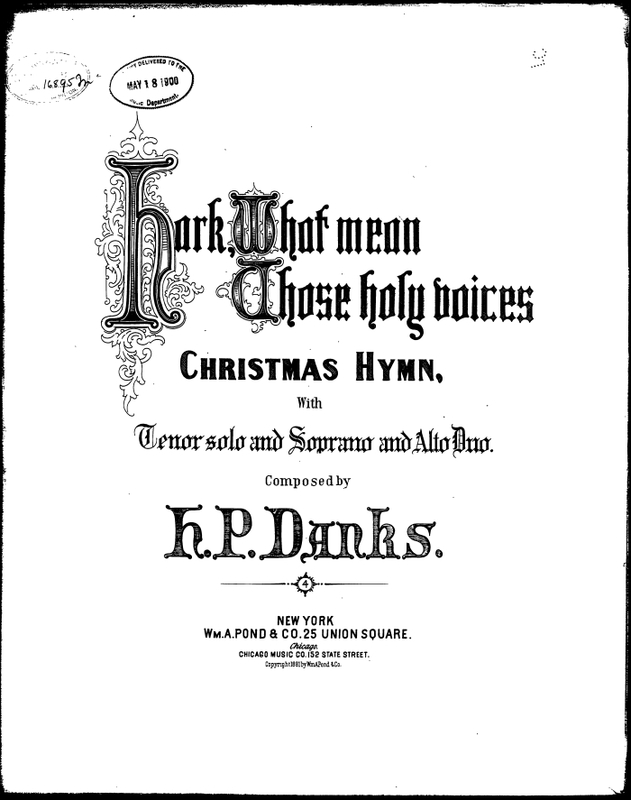 Sheet Music by Nathan Barker from William Augustine Ogden, The Anthem Choir : consisting of anthems, choruses, opening and closing pieces, adapted to dedication, ordination, installation, Christmas, funeral, missionary, and other occasions (1872), pp. 41-43, "Hark! 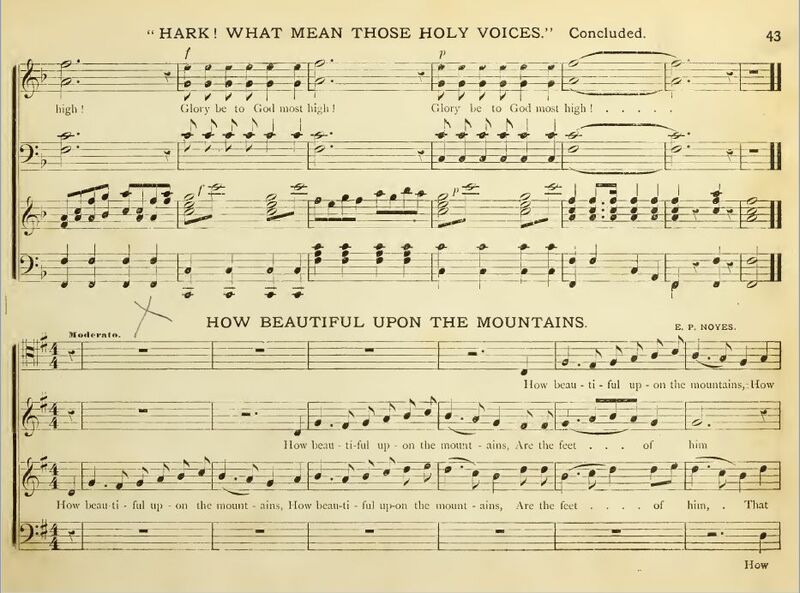 What Mean Those Holy Voices," Arranged from Donizetti by Nathan Barker. 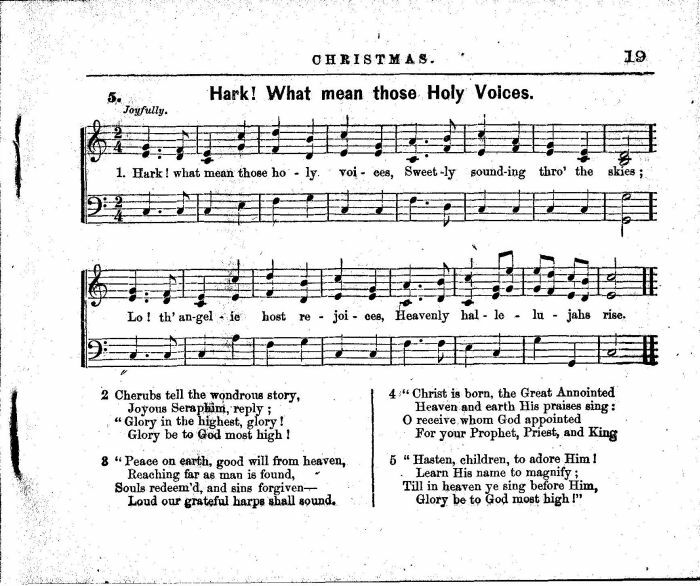 Also occurs in The Book of Christmas Hymns (London: T. Nelson and Sons, 1868), pp. 13-14; omits the sixth verse. Also found in G. Walters, A Good Christmas Box (Dudley: G. Walters, 1847, Reprinted by Michael Raven, 2007), pp. 56-57. 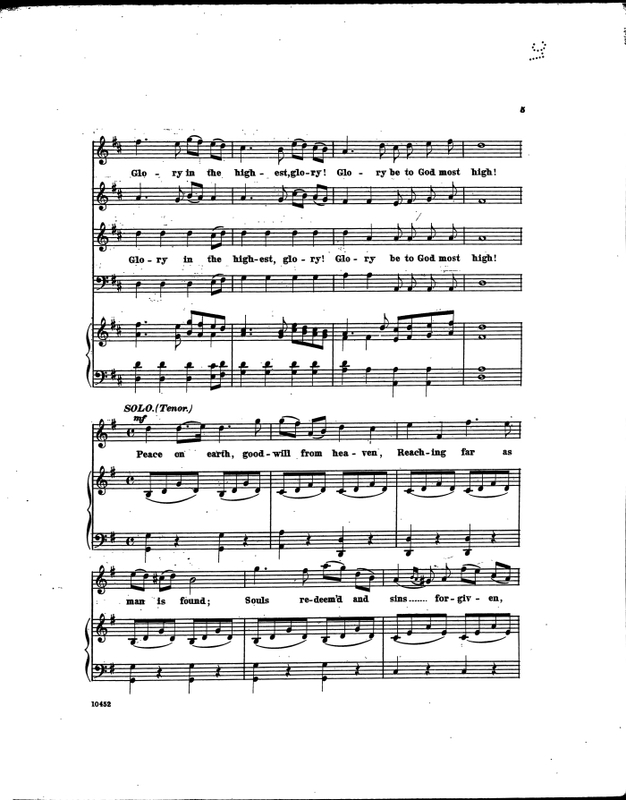 Note: Sir Arthur Sullivan also wrote a musical setting for this hymn in 1883. 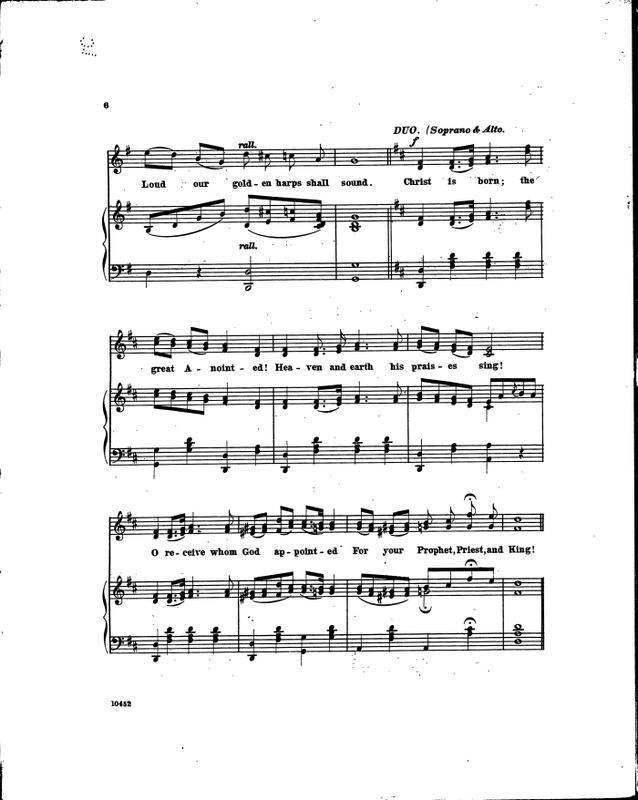 For more information, plus a MIDI file and a printable score, see A Sullivan Christmas. (links open in a new window at an exterior site). 2. 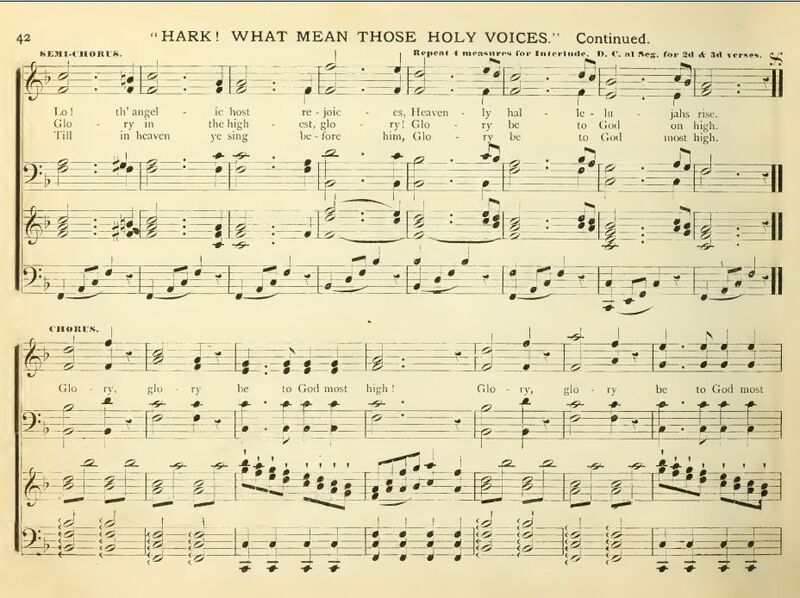 Hark What Mean Those Holy Voices (1819.) Christmas. 8. Christians, the glorious hope ye know. (1819.) Plea for Missions. 11. The Son of God, in worlds on high. (1822.) Christ's Humility.